The modern farmhouse style of this rectangular cocktail table brings homey design to your living room. Solid wood planks of acacia in warm brown finish for the thick table top complement the industrial appeal of cast iron and tubular steel base. Its stretcher and raw brushed steel finish have an authentic look for character in your decor. The Dresbane Sofa Table with Iron Base and Solid Wood Top by Signature Design by Ashley at A1 Furniture & Mattress in the Madison, WI area. Product availability may vary. Contact us for the most current availability on this product. Case Construction Table top is constructed with solid Acacia wood in a casual planked construction with visible saw marks and slightly uneven surface in a natural warm brown finish. 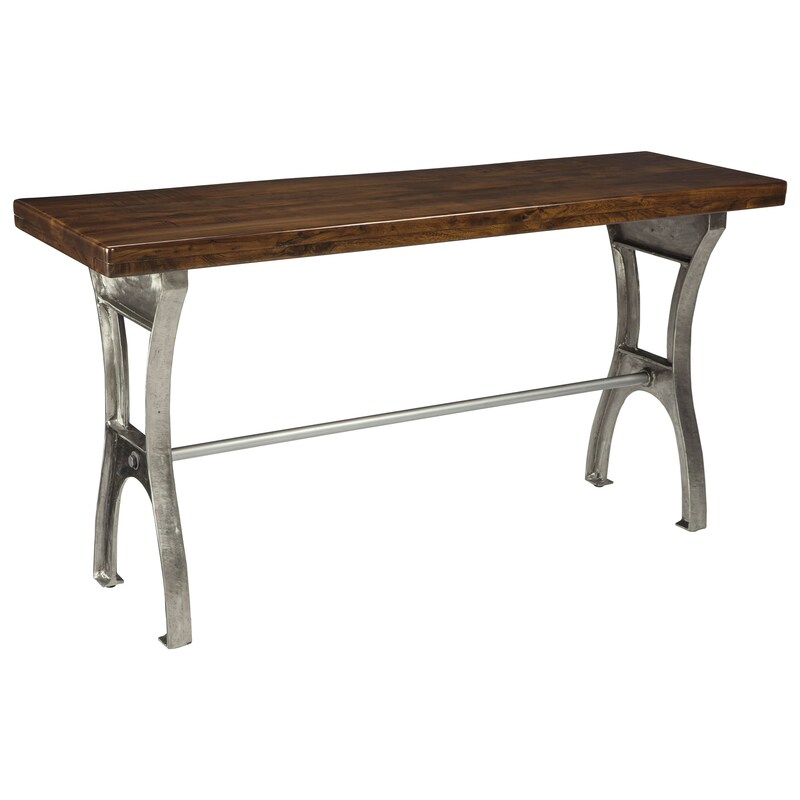 Table base is made from cast iron and tubular steel stretcher finished in a raw brushed steel color. The rustic style of the solid acacia wood table top pairs perfectly with a cast iron base in raw brushed steel finish on the tables available from this accent table collection. Taking inspiration from modern farmhouse and industrial style trends, your choice of pieces will add a unique and versatile look to your home. The Dresbane collection is a great option if you are looking for Industrial Contemporary furniture in the Madison, WI area.